Living a Fit and Full Life: Victoria Fine Foods Marinara Sauce & Marinara with Avocado Oil is Out of this World Delicious! Victoria Fine Foods Marinara Sauce & Marinara with Avocado Oil is Out of this World Delicious! We are the only major brand to put our ingredients on the front of our new label for Victoria Premium Pasta Sauce. Victoria combines a slow kettle-cooking process and uses only the finest ingredients, never adding preservatives, water, paste, or sugar to our sauces… because your family is worth it. We craft our Victoria premium pasta sauces using 100% Italian tomatoes, 100% imported olive oil and handpicked fresh onion, garlic, and herbs which are slow kettle-cooked to deliver a homemade taste. Ingredients come first. It’s not just a location, it’s a philosophy. Our traditional Marinara Sauce is prepared with imported Italian tomatoes, fresh onion, fresh garlic, fresh basil and Italian olive oil all slow cooked to perfection. All natural, without any tomato paste or fillers added. INGREDIENTS: WHOLE TOMATOES, ONIONS, OLIVE OIL, SALT, GARLIC, BASIL, SPICES. 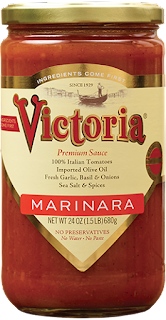 Victoria Premium Marinara Sauce is dairy free, gluten free, vegan, kosher, vegetarian, no added sugar, peanut free, soy free, shellfish free and tree nut free. Our flagship, slow-cooked marinara gets an updated twist. For our Avocado Oil Marinara, we sauté our fresh onions and garlic in antioxidant rich avocado oil. Now you can have all the benefits of avocado oil with the traditional Italian flavor you already love. A delicious indulgence you can feel good about eating. Victoria Fine Foods Marinara Sauce and Marinara with Avocado Oil is out of this world delicious! 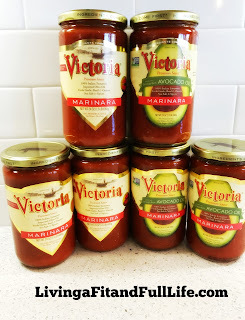 My family and I love Italian food so we've tried many different marinara sauces over the years and I have to say that Victoria Fine Foods Marinara Sauce and Marinara with Avocado Oil is definitely one of our favorites. I've actually never tried anything with avocado oil before so I wasn't too sure what to expect but I was in love with my very first bite. It was simply amazing and seemed to be the perfect marinara sauce for pizza night. I think it even helped keep the pizza crust soft which I absolutely loved. The flavor of both Victoria Fine Foods Marinara Sauce and Marinara with Avocado Oil is incredibly robust and amazingly delicious! Each one is seasoned to perfection and sure to be a favorite in your house too! 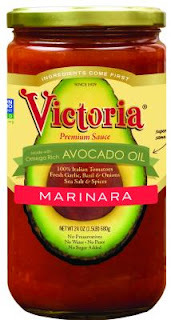 Victoria Fine Foods Marinara Sauce and Marinara with Avocado Oil is absolutely delightful and you simply must try it! Click HERE to find a store near you that sells Victoria Fine Foods! Click HERE to learn more about Victoria Fine Foods! Follow Victoria Fine Foods on social media!